As many as 200,000 Americans took to the streets on October 15 and “occupied” thousands of public squares nationwide to voice their concerns about the nation’s future. Such an outpouring of public sentiment should have been enough to attract the attention of any decent media. However, that was not the case. 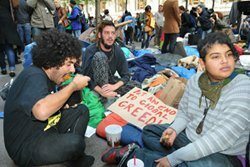 These Americans were not the angry squatters at Zuccotti Park near Wall Street in New York City. Rather, they were Americans proudly praying in over 7,500 public squares all across America asking God’s assistance in resolving the nation’s grave moral problems. 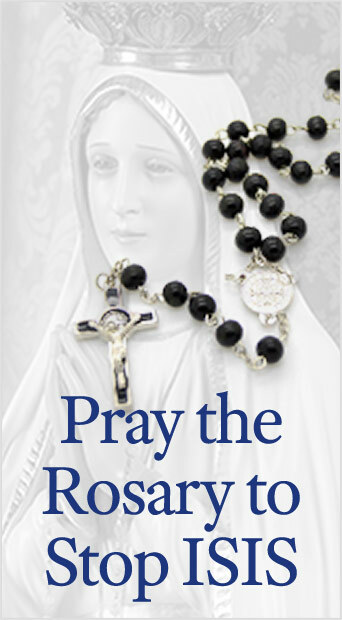 The Public Square Rosary Rally campaign is coordinated by the America Needs Fatima campaign of the American Society for the Defense of Tradition, Family and Property (TFP). It has been held every October for the last five years as an appeal for Divine assistance facing our anti-Christian culture. St. Patrick’s Cathedral, in Manhattan, in front of the Rosary Rally. 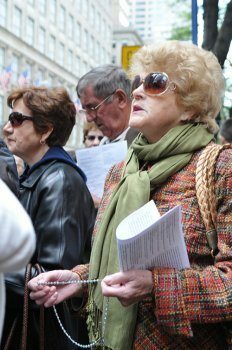 As a participant in the rosary rally on Fifth Avenue, I could not help being struck by the contrast between two opposing camps — the Public Square Rosary Rallies and the Occupy Wall Street Movement. I was hardly shocked by the corresponding media coverage. Our rally peacefully and legally “occupied” the sidewalk in front of Rockefeller Center across from St. Patrick’s Cathedral. There is probably no more conspicuous place in all America as tens of thousands daily walk down those busy sidewalks. Our demonstration of faith was extremely edifying as those present were comforted by the fact that they were joined by so many other rallies all over the country. Actually, there were probably well over a hundred rallies within the New York metropolitan area. There were forty in the Bronx alone. One participant at our symbolic rally on Fifth Avenue told me that all her friends had gone to local rallies. The idea of local organization was so strong that one local rally captain insisted on holding a separate rally within earshot of our own. 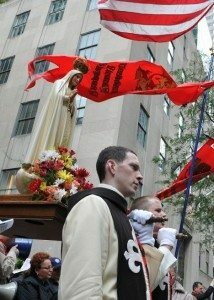 Our Lady of Fatima carried by TFP volunteers in ceremonial habit during the Manhattan Rosary Rally. Participants were from all walks of life: strong in their faith and determined to give public witness that human solutions are not enough. I was impressed by how they almost shouted out their Hail Marys over the din of the busy street and knelt on the sidewalk without human respect. A few passersby would pray a Hail Mary or two while others even joined the crowd for the entire event. The bagpipes echoed up and down the concrete canyon to the strains of “Hail Holy Queen Enthroned Above.” The effect was electrifying as one felt as if Our Lady was actually queen of the public square for at least a short time. Everything about the Rosary Rally reflected beauty, calm and order, attracting the blessings of God. What impressed me most was the calm and joy of the participants who sensed the importance of what they were doing. 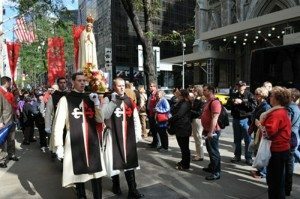 They were publicly appealing to a higher authority asking our Blessed Mother to come to our aid. As a result, a palpable blessing came over the rally. At times the wind would blow intensely making it difficult to hold the American flag and the four TFP standards. At other times, the wind calmed down and the sun would illuminate the crowd almost as if Our Lady was smiling upon our efforts. Everything about the rally reflected beauty, calm and order. Everyone left with the impression that our prayers were heard. We felt new resolve to continue fighting in the public square against an anti-Christian culture. 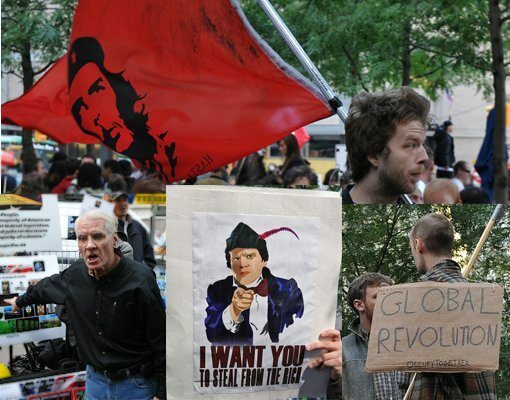 On the other side of the city, Occupy Wall Street protesters raged. It could not be more contrary to our own rally. 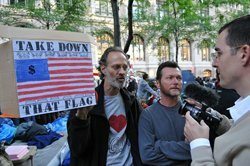 In fact, after the public square rosary, I went to Zuccotti Park to see what Occupy Wall Street was all about. I found an anti-rosary rally. 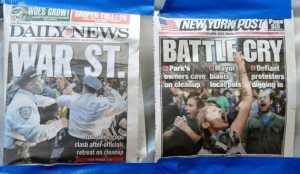 On the other side of town however, everything in the “Occupy Wall Street” camp reflected disorder, agitation, chaos, resentment and revolt. “Non in commotione Dominus,”1 God is not in agitation. The climate was one of deliberate chaos and agitation. Tribal drums beat out their message as the protesters sat and stood around the perimeter of the small park with primitive cardboard signs championing every leftist, ecological or sexual cause imaginable and unimaginable. A Woodstock atmosphere pervaded amid the tarps and sleeping bags that littered the once clean sidewalks and well-kept lawns of the privately owned park. erupted in violent clashes with Police. What impressed me was not so much the uncleanliness of the place (although it was aggressive); it was not even the wildly contradictory messages that the different protesters presented. Rather it was the agitated spirit of revolt that permeated the whole area. This spirit would manifest itself in displays of resentment, bitterness or even a veiled politeness on the part of those there. It would erupt into outright hatred as in the case I saw of a street preacher upon whom the protesters heaped abuse and insults. Earlier it had erupted in violent clashes with the police. I could not help but think how different these people — united in revolt — were from those who had just been united in prayer. One could not help but reflect how different these people — united in revolt — were from those who had just been united in prayer. 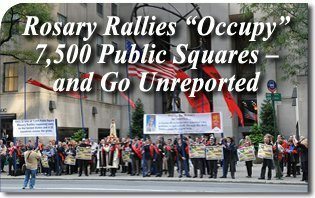 Throughout it all, the media, that could not see 7,500 “invisible” public square rosary rallies, flocked to Zuccotti Park seemingly eager to turn this motley assembly into revolutionaries of a pseudo-class struggle using a script straight out of Marx’s Communist Manifesto. public squares dwarfed the efforts of these wannabe revolutionaries who have unsuccessfully tried to build enthusiasm by holding gatherings in places outside New York City. Judging from media reports, I calculated that the nearly 200,000 Americans who turned to God in the public square probably outnumbered these poor partisans of the left by over three to one. The media did not take note of our efforts, but millions of American passersby did. Above all, God took note. I was also comforted by the conviction that these prayers were not in vain. Our Lady at Fatima predicted her triumph over communism in all of its many forms. If we continue to pray, fight for our culture and oppose socialism, she will not fail to come to our aid. Cf. Latin Vulgate Bible, 3rd Book of Kings, Chapter 19, 11. This entry was posted in Public Square Rosary and tagged Agitation, America, ANF, bagpipe, Blessed, bronx, campaign, captain, Cathedral, ceremonial, chaos, Christian, city, Class Struggle, Communist Manifesto, contradict, crowd, crusade, culture, Divine, ecologic, faith, Family, Fatima, flag, God, habit, holy, human, hundred, left, Manhattan, Marx, Mary, Media, metropolitan, million, moral, nation, New York, Occupy, October, Patrick's, peace, police, pray, problems, Property, protest, public, Queen, rage, rally, resent, revolt, revolution, Rockefeller Center, rosary, Saint, sidewalk, socialism, society, square, squatter, standard, street, TFP, thousand, throne, Tradition, volunteer, Wall Street, Woodstock, Zuccotti Park by TFP.org. Bookmark the permalink.